Ketan (formerly of Wisc, formerly of Harvard, going to Oxford for grad school in Philosophy) came down to my Summer Latin Program a few years ago. It was good to see him. The convention is now in full swing. For the OH students, this is now their 4th day on campus. Lack of sleep is beginning to take its toll. 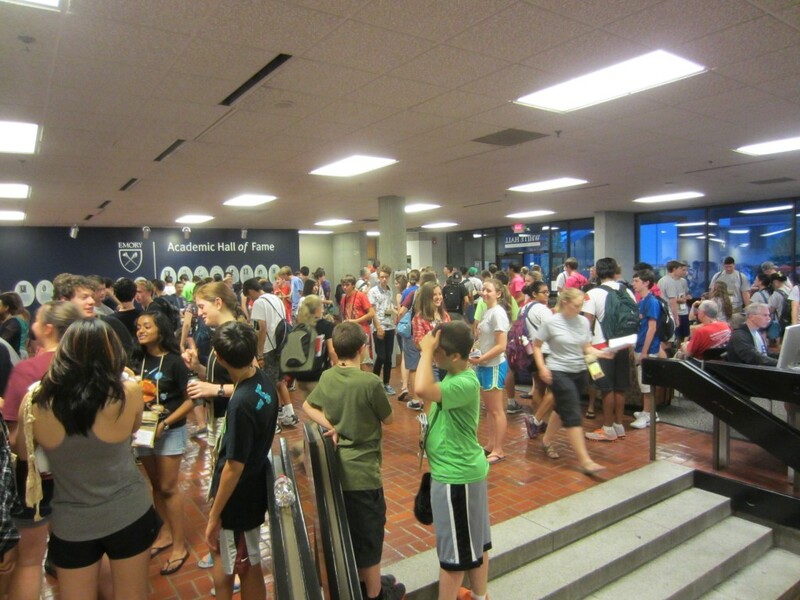 A number of students overslept and did not make the 8:30 am test session. There are 4 in all, with 3-4 tests per session. I encouraged them to make the last one tomorrow morning. I saw KC Kless, Indian Hill teacher and husband of McAuley teacher Rachel Ritchie-Kless, with his young son Sam yesterday. Sam was not happy. Sam wanted his mom. Sam heard a helicopter. Sam started to fell better. Narayan participated in ‘Meet the Candidates’ for about an hour. It was a time for delegates to talk one-on-one with the students running for national office. There were a number of OH students talking with other candidates, including Jesse Campbell, Adam Sichel, Tim Goldenberg, Connor Forney, and I know there were others but that is all I can remember. 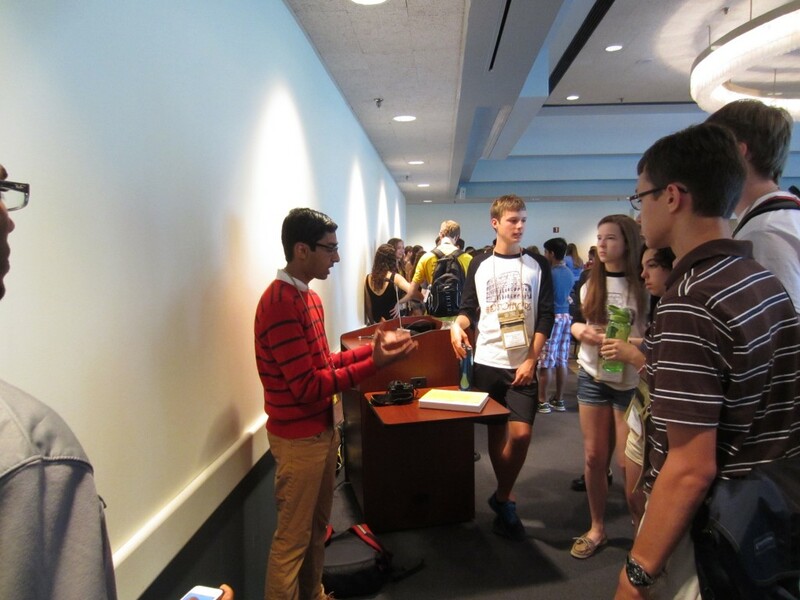 Narayan explains his ideas to a small crowd. Round 2 of Certamen was after lunch. 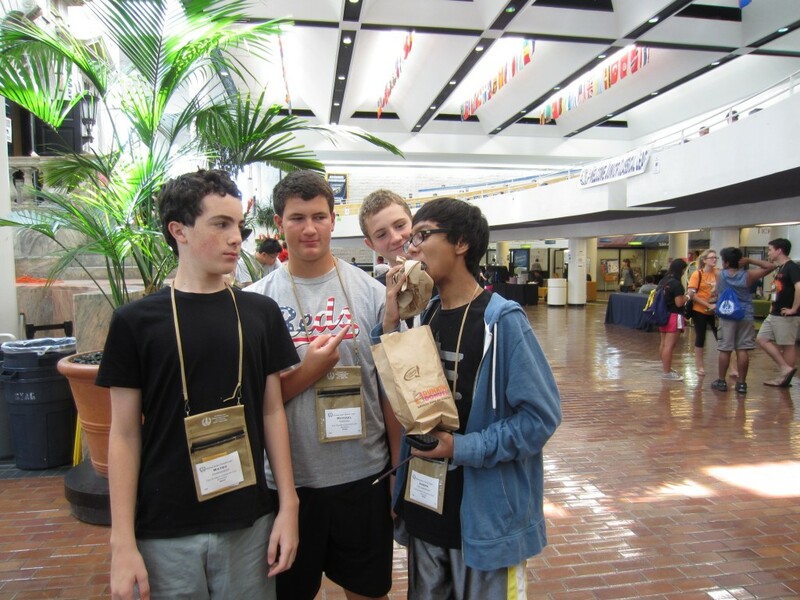 The Advanced team had an easy round against some less experienced states. They scored 165, which is quite good, but they missed a chance to rack up some big points. The Intermediate team faced TN, which often has very good teams. They did a great job and scored 145. Similar to the Advanced, the Intermediates felt that they should have had even more pts. The Novice was up against VA, always a well-trained group. 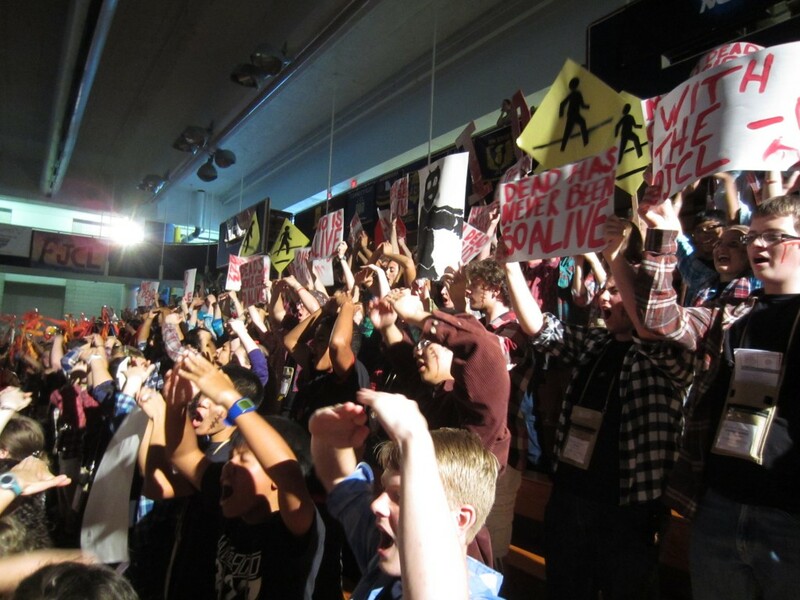 They got on track, started to buzz more quickly, and gained some nice momentum with 95 points. Both Alex and Adam earned points for the Advanced team in Round 2. OH Historian Will Beatrez won 7th for his state scrapbook. Euge! Shaker earned 9th place (I think) for their Club Scrapbook. The OH delegation earned 2nd place in Spirit prior to GA 3. The theme was ‘The Walking Dead Language.’ Congrats to everyone, esp. Treasurer Lindsey Dierig. The prize was Zombie teeth. OH Zombies show that Latin is not dead. During GA 3, all the candidates for office gave their campaign speeches. The VA President (sorry, I can’t remember her name, but she attended the OJCL Convention in March) introduced Narayan. 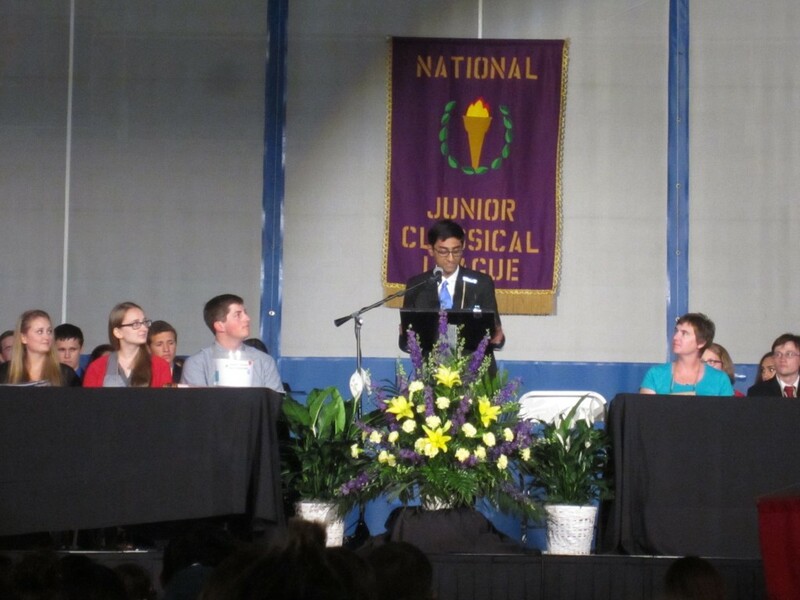 He gave a great speech and talked about when he was a scrawny, shy 8th grader at his 1st NJCL. He noted that he was no longer shy but still a bit scrawny. And, of course, Narayan listed his many qualifications and explained his campaign platform. Narayan Sundararajan addresses the GA. 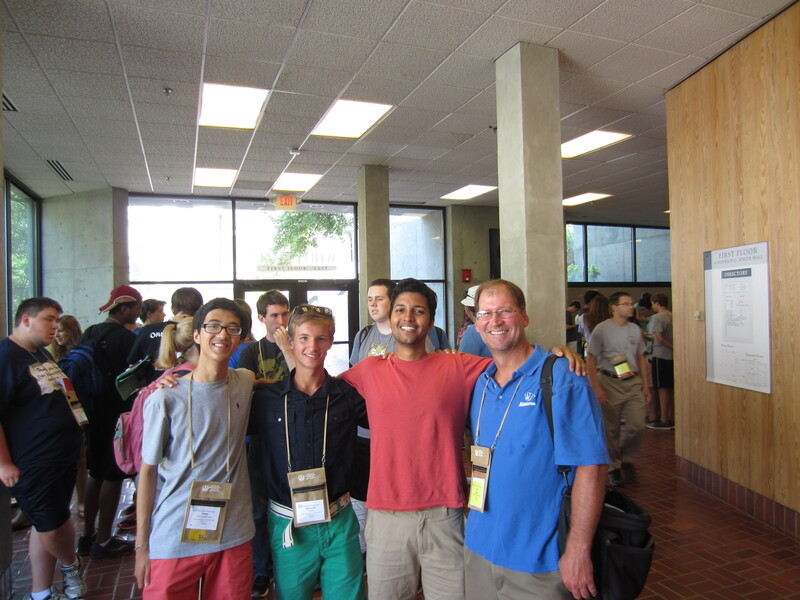 The 3rd and final preliminary round of certamen was after dinner, and all the teams did very well. The Advanced team again had a relatively easily round and scored 145. Alex nailed the myth category. The Intermediate team also had an easy round and dominated the match: Blake on the language questions, Sam on myth, and Tullus in history. In the end, they earned 135 pts. The Novice team finally started clicking, with all 4 players getting toss-ups. Charlie answered 2 questions during a team surge in the 2nd half, Joseph continued his steady play, Caroline got 4 of the 5 myth questions, and Michael answered the final question about the net-carrying gladiator called the ‘retiarius’ to take the team up to 215 pts! The semi-finals are set (sort of). Novice and Advanced play at 10:30, and the Intermediate matches take place afterwards. Wyoming teacher Todd Wegenhard – husband of Melissa and father of Ajax (back at home with relatives) and Director of the ‘Teaching Material and Resource Center’ – arrived on campus to sell stuff and to make a presentation at the Teacher Exchange tomorrow morning. He and his materials for sale were perfectly positioned outside the door of the dance. Megan Whitace – sister of Matt Whitacre (St. Xavier) and formerly of McAuley and formerly of Holy Cross – also arrived on campus. She was a mainstay on the OH certamen teams ‘back in the day’ and will be beginning her career as a Latin teacher in a few weeks down in Mississippi! Keep that classical torch burning, Megan! Julia and Caroline Kubicki (Summit) also did the Costume Contest. They were dressed as Selene, the goddess of the Moon, and her boyfriend Endymion. They said the presentation went really well. There was a Greek language and culture certamen for the 1st time. Alex of Westlake played on a team called ‘Highway to Hellas.’ Sameer, Maria, Narayan, and Ben of Shaker did well and finished 2nd in their semi-finals match. Joseph demonstrates how to eat a donut. 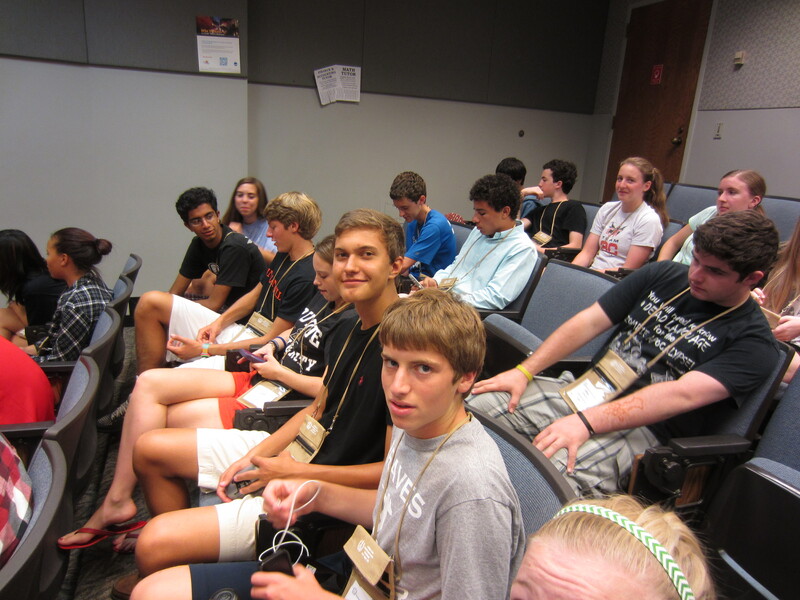 OH students wait patiently for the start of the next certamen match.